What Are Smart Earbuds or Hearables? Smart earbuds, also known as hearables, are wireless in-ear smart devices that provide extra features beyond transmitting sound. Hearables use Bluetooth technology to sync with your smartphone, tablet, PC, and even some smart home systems. Smart earbuds use a hybrid of hearing aid technology and biometrics technology that go beyond wireless headphones. At first glance, smart earbuds appear to be everyday headphones that just cut the cord. So, what makes smart earbuds different from normal ones? Hearables have unique features and capabilities normal earbuds have never had. Let’s take a look at what smart earbuds can do. Features available vary between manufacturers and models. Sound quality: Pairing traditional consumer sound technology with the corrective features of hearing aid technology improves sound quality. Hearables can amplify sound while still protecting your hearing, and can enhance sound quality with noise monitoring features that help filter or cancel competing sounds for clarity. Sync with smart devices: Using Bluetooth technology, smart earbuds can sync with your smartphone, tablet, computer, and even your smart home system. Smart earbuds have both speakers and microphones built in so you can use voice activation and capabilities of Apple Siri, Google Now, Amazon Alexa, and Microsoft Cortana to communicate with your smart devices. Stream calls, music, and more: When synced with your smartphone, you can answer calls with your smart earbuds, listen to messages, listen to the news, get updates on the weather, and stream music from Pandora, Spotify, or Apple Music. Some models include gesture recognition, so answering an incoming call can be as easy as nodding “yes” to answer or shaking your head “no” to decline. Layered listening: Hearables allow you to customize how much you hear from the environment around you along with your music or calls. You can choose to completely cancel out surrounding noise and hear only your music or adjust the level of environmental noise you hear along with your music to remain alert to sounds around you (on a busy street, for example). Some models may call this feature by a different name, such as Passive Noise Isolation. However, the ability to customize the level of environmental noise you hear along with your music or call whenever you like is an advancement of the layered listening feature borrowed from the hearing aid technology space. Operating system updates: Similar to your smartphone, your hearables work using an operating system that receives updates and bug fixes. Even better, updates can add new features or additional options for existing features as they become available so your smart earbuds get even smarter over time. Smart earbuds go wherever you do. You can leave your phone at home while your hearables bring your music with you. You can go for a swim with waterproof models. You can even visit another country and your hearables can translate as many as 40 languages for you. Onboard data storage: Hearables have onboard storage (most models have 4GB, room for you to upload approximately 1000 songs) for when you want to disconnect from the world and leave your smartphone at home. On-the-go charging: The case for your smart earbuds also doubles as a charging dock, so you can recharge your hearables while on-the-go. Depending on the model, the case can provide between three to five full recharges. Battery life for listening time generally ranges from three to seven hours. Waterproof: Many hearables are waterproof for activities like swimming and watersports or at least sweatproof to protect the devices during your favorite activities. Real-time translation: A few models offer real-time translation. After a sentence or two, smart earbuds can recognize a foreign language and translate what’s being said into your native language (though you’ll need your smartphone handy to use this feature). Monitor biometrics: Smart earbuds can monitor heart rate, blood pressure, pulse oximetry (amount of oxygen in the blood), body temperature, respiration rate, steps taken, and calories burned. Hearables log your biometric data into an app on your smartphone so you can track it over time. Fitness coaching: Smart earbuds can use the biometric data gathered in sync with your smartphone to provide real-time fitness coaching including detecting your exhaustion level to provide pacing advice and giving feedback on your running technique. Biometric identification: The shape and size of your ears are as unique as your fingerprints. Some models use sound wave detection to map your unique ears for security so your hearables can tell it’s you when you put them in — and recognize when someone else tries to use them and shut down. Custom molding: If you have difficult to fit ears or simply want a perfect fit, one brand (Bragi in partnership with Starkey Hearing Technologies) has the option to have your hearables custom molded specifically for you. An authorized audiologist will create digital impressions of your ears and submit the data to the company. The customized earbuds are created using 3D printed shells to fit the exact shape of your ear and ear canal. As an emerging technology, there are several start-ups and new products being developed. Here are a few of the options available to consider. The Dash Pro: Bragi was the first company to bring hearables to the market. The Dash Pro wireless earbuds are available with a standard set of different sized changeable tips and sleeves or The Dash Pro TailoredFit provides the custom molded option from Starkey Hearing Technologies. Bragi earbuds work with iOS, Android, and Windows. Samsung Gear IconX: Samsung’s Gear IconX earbuds work with Android devices (but some features only work with Samsung Galaxy phones). They come with eartips and wingtips in three sizes and have a longer battery life than some other models available. A quick note about Apple's Airpods: Airpods are wireless, provide quality sound, sync with your phone, and are rechargeable. 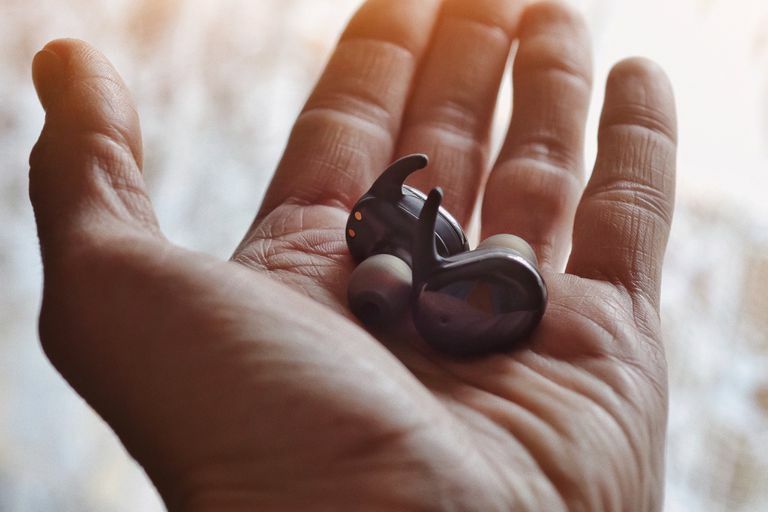 However, they are not technically classified as smart earbuds or hearables because they do not yet include many of the key features of hearables, such as independent data storage in the earbuds themselves, waterproofing, or biometrics features.